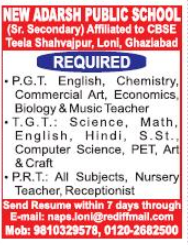 New Adarsh Public School, Ghaziabad has advertised in Hindustan Times Newspaper for the recruitment of PGT plus TGT plus PRT job vacancies. Interested and eligible job aspirants are requested to apply with in 7 days. Check out further more details below. About School: We believe that the initial steps in education begin here. We do this by providing a secure, caring and nurturing environment to enable students to develop the desire and passion for learning both now and in the future. The passion for learning is contagious. We believe that developing the passion for Learning is a large part of responsibility shouldered by us. Education is a progressing journey and on this path we at NAPS go hand in hand with students.